Intimidation Clothing is proud to announce their continued partnership with the GriffonRawl MMA Academy as the two companies are set to release a new, custom hoodie. The zip-up hoodie, which will be available for pre-order at the GriffonRawl IGC Tournament on November 23rd in Mentor, Ohio, is the first co-branded hoodie from the two companies after the release of a co-branded tee a year ago. The new hoodie joins the co-branded tees, beanies and bags that have been for sale at the gym over the past several years. Established in 1997, GriffonRawl MMA Academy is owned and operated by UFC and The Ultimate Fighter 9 veteran Jason Dent, who is one of the most popular fighters in the state of Ohio. Alongside Dent is fellow UFC veteran Donny Walker, as well as top MMA prospect George Comer, all of which are regularly sponsored by the Intimidation brand. Along with sponsoring the gym’s pro fighters, Intimidation has been a sponsor of GriffonRawl amateur fighters for the past four years. GriffonRawl is also an official Intimidation Clothing dealer, and along with the new GriffonRawl tee, both Jason Dent and Donny Walker have their own signature tees available for sale at the gym and online at IntimidationClothing.com as well. Intimidation Clothing is proud to announce its sponsorship of the upcoming third annual GriffonRawl IGC Grappling Tournament at the GriffonRawl Academy in Mentor, Ohio on November 23rd. The third annual tournament, the IGC is an internal grappling tournament that also features invites from select gyms in the region like Rising Dragon MMA, Rock Hard MMA, Vanyo Martial Arts, Strong Style MMA, Evolve MMA, World Kickboxing Academy, and more. A longtime sponsor of GriffonRawl athletes and UFC veterans Jason Dent and Donny Walker, as well as pro George Comer and more, Intimidation will be live at the event with special one-time pricing on select items including the Jason “Dynamite” Dent and Donny “Eagle Eye” Walker signature tees. The GriffonRawl Academy is also an Intimidation Clothing dealer as the two have worked together for years with Intimidation also sponsoring nearly every seminar and special event at the gym in the past three years. The GriffonRawl IGC Grappling Tournament features a double elimination format, where first place in each division receives a trophy while second place finishers will receive a medal. The tournament features seven weight classes with traditional MMA weight limits (135, 145, 155, 170, 185, 205, and 265 pounds) and will be seeded by tournament officials. Although the tournament is an internal tournament, grapplers from other gym are welcome on an invite-only basis. To be considered for invitation, you can contact Jason Dent at 440-358-9371. For more information, click HERE. Intimidation Clothing prides itself on seeking out the top up-and-coming talent in the mixed martial arts industry and beyond, and it would stand to reason that many Team Intimidation alums would go on to see successes at the top level of the sport, the Ultimate Fighting Championship. Currently one of the UFC’s hottest heavyweight prospects, Miocic was sponsored by Intimidation during his NAAFS Heavyweight Championship title run in 2011 as he began his pro career at 6-0 before signing with the UFC. The former collegiate baseball player and wrestler is a member of the Strong Style Fight Team – which is an official Intimidation dealer – alongside other Team Intimidation members Brian Rogers, John Hawk, Joe Heiland and more. He most recently defeated Gabriel Gonzaga in January at UFC on FOX 11 and moved his UFC record to 5-1. When Bellator MMA dissolved its women’s division earlier this year, the Strong Style product became the hottest free agent in MMA. Just days later, she signed on to be a part of the UFC’s fast-growing women’s bantamweight division. The Ohio native put her 7-fight winning streak on the line when she made her organizational debut against former Strikeforce champion Sarah Kaufman at UFC 166 on October 19th where Eye earned a hard-fought split decision win (which was later overturned to a no contest). She will be back in the cage at UFC 170 when she faces Alexis Davis. Intimidation’s Jessica Eye signature shirt is one of the company’s most popular fighter shirts and Intimidation is also the former online outlet of the Eye Believe line of clothing & merchandise. One of the best knockout artists in MMA, the Cincinnati product made his UFC debut earlier this year on the heels of having two knockout wins over the span of three fights. Now at lightweight, Bowling (pictured on left with Brian Rogers) continues to be one of the more underrated fighters in the UFC. Bowling went 4-3 in his seven Strikeforce fights and was sponsored before his Strikeforce signing and multiple times inside the Strikeforce cage by Intimidation, who also makes the Roger Bowling signature tee. This well-rounded fighter has a background in both karate and wrestling, and he made his way into the UFC after starring on The Ultimate Fighter 15. He has put together an impressive 4-2 record inside the Octagon, including wins over tough veteran Yves Edwards and Mike Rio in his last outing at UFC on FOX 11. The Michigan native is currently climing the UFC’s steep lightweight ladder. Intimidation and Cruickshank worked together for nearly two years over a span of five fights before signing with the UFC as he went 5-0 while sponsored by the Intimidation brand. Sara McMann, the silver medal winner in the 2004 Olympic Games in Athens, is also a 3-time medalist at the FILA World Championships, taking home silver in 2003 and bronze in both 2005 and 2007. After a career in wrestling at 138 pounds, McMann has made a name for herself in Mixed Martial Arts at 135 lbs and is 7-0 after defeating Shiela Gaff at UFC 159. McMann will get a title shot next and face Ronda Rousey at UFC 170 in February 2014. The newest member of the UFC’s roster from this list, Lapsley signed in mid-October to fight at UFC 167. A native of Indiana, Lapsley brought a 4-fight winning streak into his UFC debut, including three submissions. Intimidation has sponsored Lapsley in multiple bouts, including his recent victory over Gerald Meerschaert at Rocktagon 23 in Cleveland in 2013. The veteran fighter has earned 15 career submission victories, and he has won 8 of his last 10. Lapsley (22-6) made his UFC debut at UFC 167 in Las Vegas last November. Intimidation Clothing is a fast-growing brand of lifestyle apparel & MMA training gear with a growing national presence and over 50 authorized dealers across the USA. The Intimidation brand is regularly featured on multiple sporting events on SpikeTV, AXS TV, SportsTime Ohio, MTV2, FUEL TV, The Comcast Network, Comcast SportsNet and EpixHD as well as MMA highlight shows on Spike TV, AXS TV and more. In addition to over 110 styles of high-quality, bold t-shirts and sweatshirts for men, women and children the brand is well known for their popular Vintage Series, Support Local MMA tees and Intimidate Cancer lines of merchandise. Anyone interested can become a dealer by applying to sell the Intimidation brand which is also available for sale online at IntimidationClothing.com. Fans can also follow the marketing wing of the Intimidation brand, Intimidation Interactive Media, @IntimidationIM, like Intimidation Clothing on Facebook or follow @IntimidationMMA on Twitter. 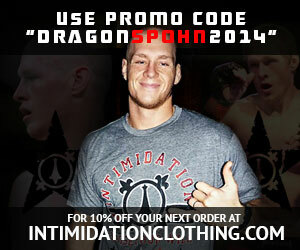 It was yet another busy weekend for the Intimidation brand with pro fighters in Minnesota and Pennsylvania in action. While the Intimidation crew traveled to Canonsburg, Pennsylvania south of Pittsburgh, the hot-seller of the weekend was Intimidation’s soon to be released Mark Cherico signature tee which is now available for pre-order. More importantly, Cherico (pictured, right) was among four young featherweight prospects in the pro MMA ranks who scored impressive wins. Former CFA Featherweight Champion Jordan Parsons returned to the cage for the first time in nearly a year at the Driller/SEG event “Havoc at the Hyatt” in Minneapolis, Minnesota on Saturday night. Facing a tough Derek Getzel (7-5), Parsons scored a unanimous decision win to improve to 8-1 as a pro and keep the spotlight on his chances at being a top featherweight in the sport. Meanwhile, just south of Pittsburgh, another three featherweight prospects from Fight Club Pittsburgh were in action. Mark “The Pride of Bloomfield” Cherico took on another long-time member of Team Intimidation in UFC veteran Donny “Eagle Eye” Walker in the main event at Pinnacle FC’s Pittsburgh Challenge Series 3 event. After a solid first round which saw Cherico open up a cut on Walker’s forehead, he earned a doctor’s stoppage TKO in round 2, easily the most impressive win of his career, to improve to 5-0 as a pro. Also in action at the Pinnacle event were fellow featherweights Justin Steave and Khama Worthy (pictured, left) who both picked up impressive wins. Steave improved to 5-2 with a unanimous decision win for his 4th straight victory and Worthy, making his debut at 145lbs, scored a TKO win over cross-town rival Francis Healy. In addition, Intimidation was a proud sponsor of Donny Walker in his main event fight with Cherico and Mike Wiseman, who dropped a split decision to fall to 1-1 as a pro. Intimidation Clothing is pleased to announce its sponsorship of professional fighter Justin “The Hawk” Steave in his upcoming bout at Pinnacle FC 3 outside of Pittsburgh on June 29th. Steave (4-2), a product of Fight Club Pittsburgh, is set to take on fellow Pennsylvania featherweight Mike Diggs (7-4) in one of the featured pro fights on the card that includes Intimidation sponsored Khama Worthy and both Mark Cherico and Donny Walker in the main event. A longtime member of Team Intimidation dating back to his amateur career, Steave is a native of Weirton, West Virginia and trains at Fight Club Pittsburgh, an official Intimidation Clothing dealer, in the Steel City. A fan favorite who has been fighting since 2006, Steave has claimed 3 straight professional wins, with his most recent victory coming over Tray Taylor in the form of a 19-second knockout in January. He also claimed a victory Amran Aliyev at the Pinnacle FC’s Pittsburgh Challenge Series 1 event in December, and prior to that, he stopped Donte Adams with a TKO in the first round at NAAFS: Caged Fury 18 in August. Steave is often referred to as a “fighter’s fighter,” and he can regularly be seen cornering his teammates at local events as well as his friend Nah-Shon Burrell in the UFC.